We’re busy moving this week and we’re not doing a whole lot of cooking. 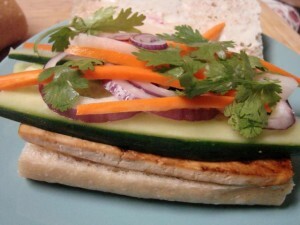 I thought this would be a good excuse to share an old favorite with you: banh mi. This is a classic Vietnamese sandwich that is extremely flavorful and not much work. The photo is pretty self-explanatory, so all you need to know is how to make the pickled veggies. This is best made at least a day ahead. There are many recipes available online, including this one. The only thing we insist on doing is taking the extra time to cut the vegetables into thin matchsticks instead of shredding. We love that extra crunch you get. Also, most recipes call for equal parts carrot and diakon, but we usually go for more carrot and less diakon. Try whatever ratio you think you will like. We also sometimes add a pinch of red pepper flakes to the vinegar mixture for a little extra kick. A note about the bread: it might be a challenge to find the perfect bread for banh mi. The bread should be super light, and not chewy. The stuff we have found that works best feels almost stale without being hard. It’s a fun search, so don’t be discouraged! We hope you’ll try this sandwich someday soon. Looks yummy. And I didn’t even know you were moving! Good luck.